Our unique platform creating live multilingual comedy events in some of the world's very coolest contemporary cities Barcelona, Madrid, Rio and Lisbon each with their own individual website, complete social media offering an incredible opportunity to target directly an audience on a range of levels. From sponsoring individual shows or artists that via a certain language can inherently take your brand to a definitive market within any of the cities like no other vehicle. This is a young exciting project and offers the opportunity now (2015) to link your brand directly with the development of this truly unique entertainment vehicle. We wish to develop relationships with brands and logistical partners to work together to create real value in both directions. FIC organisation has been working with Festival events primarily in Spain since 2002 and in that time we have enjoyed support both from the Public (Arts Funding) and Private sector (everything from National airlines to beer companies). 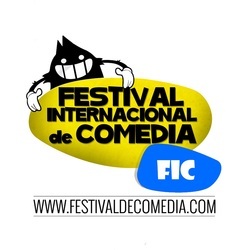 This pioneering project, Festival Internacional de Comedia had many unknowns as to how best to deliver a multilingual comedy festival event and was accompanied by a patient business plan. It has been quite a challenge, very different cities with very different dynamics but through practical trial and error and finding our way to the best model that can develop anywhere. In this time the local comedy industries have developed, each with their own distinctive identities and possibilities that can work easily with our FIC model. The concept still has an essential core, the event! A meeting between the entertainer and public in a quality venue bringing a joyous experience to an audience that no matter what their nationality they share laughter until they cry as an innate human instinct. Through sponsorship you can gain incredible positive association for your brand. CLICK HERE TO GET IN CONTACT AND FIND OUT WHAT WE CAN TAILOR FOR YOU!! For global brands who want to put their name on and help take the whole project forward universally and so inherently ensure a presence in each city through individual festival dates and whatever action takes place within the local brand umbrellas. MAIN SPONSORS Within each individual festival we have a range of possibilities. SUPPORTING EVENT SPONSORS Event by event we have exciting possibilities to suit every budget, the Funniest FICer amateur comedy competitions, the possibility to sponsor a your own branded Stage, film and content generation. A man who knows a thing or two about comedy looks into the science behind the positive nature of laughter! !